Tesshi-e wants to wish you a Happy Halloween, a Happy Weekday Escape, and even some Happy Hippos. There are loads of happy here to go around, in fact—it's spilling over into every imaginable place a mirthful golden token could hide in The Happy Escape 3, the 78th escape-the-room game from the designer whose characteristic whimsical style sets genre standards. Point-and-click your way around the room, deciphering clues and solving puzzles until you have found ten "happy coins" that spell the exit from this hexagonal room, which seems quite familiar, after all didn't we just escape into it from an entrance hall? There's no changing cursor to lead you, but as everything is interesting, you'll want to explore it all. Pick up anything you can (that isn't screwed down) and examine it closely, pondering out the many ways you can put it to good use. 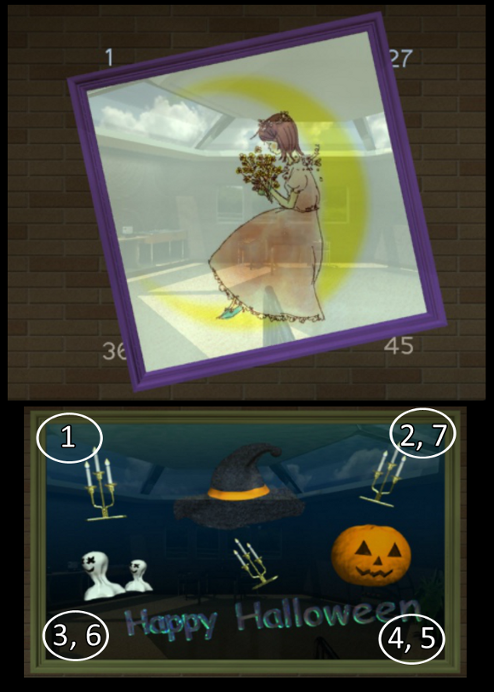 As you go, you'll gather up three Halloween-themed ornaments, solve the enigma of the wobbly picture, say hello to Mr. Birdy and encounter one of Tesshi-e's most esoteric hints; make sure your lateral thinking is in the game and you'll be well prepared to break the clever codes. Just like the first and second happy escapes, there is only one ending but as the title promises, it is a happy one. So, are you happy? I'm happy! Look at me, really, I'm ecstatic. Few things make the day more happy than opening up Jay Is Games and seeing a new Tesshi-e waiting for you. So now go play. Go have a happy—a lot of it! 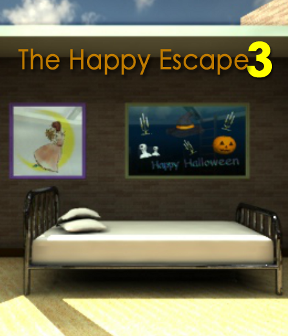 The Happy Escape 3 Walkthrough now available! When you begin, you're facing a wooden door. Zoom in on the red table. Here you see a baseball, a soccer ball, and another baseball. Below the balls, a 4-digit code is needed. Using lateral thinking, determine the correct four numbers to solve this ridde. The hint is on the table, but you may need to use Google if you're not familiar with sports. Once you've entered the proper code, the first HAPPY COIN (1/10) will drop out of the slot. Take it. Hidden among its leaves is HAPPY COIN (2/10). Get it! The frame wobbles when you click its corners. Also notice the three symbols on the front. Return to the "Happy Halloween" picture and use the information you just learned to click on its corners in the proper order..
TL = top right; etc. Back up and turn right twice. An unusual looking ornament: N U M B E R.
Four Hippos in a row. 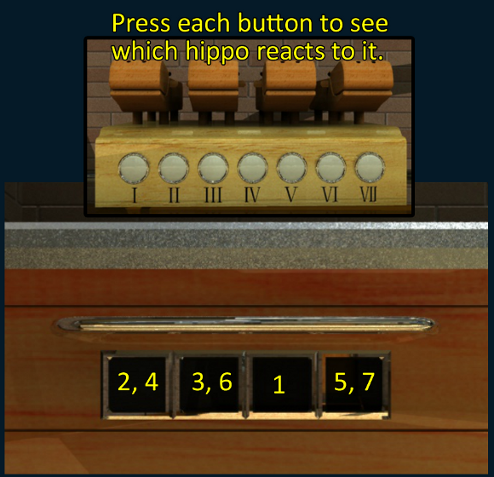 When you press each of the seven buttons, a specific hippo's mouth will open. A black base, seemingly to display three square items. There is a panel in the floor, but it's locked. Back out and turn right. Zoom in on the table to see a Mr. Birdy ornament! Press the button on Mr. Birdy's base and then make note of the colorful lights. Back up and turn right again. Inside the sink you'll find a HAT-SHAPED ORNAMENT. Take it. There are four buttons that light up when you click them. You need to know the correct sequence to open this drawer. A line of four things that you've already seen in this room will give you that sequence. the bottom part proves more interesting. Playing with the four buttons on the bottom door, you notice that each are a different color. Where did you see four colors before? There's an ICE CUBE and a happy coin is frozen inside of it. You'll need to melt the ice to get to it. Open up the cylinder compartment on the stove and insert the CANISTER OF GAS. Examine the POT in your inventory. Put the ICE CUBE inside the pot. Place the "ice in the POT" on the stove. The ice has melted but the water is too hot to reach inside. Back up and turn off the stove. Now the water has cooled and you can take the HAPPY COIN (4/10). 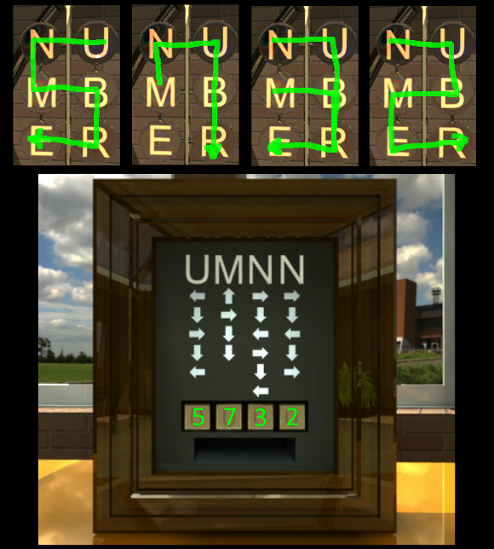 You see the letters "U M N N" with a series of arrows underneath. Somewhere else in this room you saw those same letters on display. Enter the correct 4-digit code to see what comes out of the slot. This matches-up with the "unusual N U M B E R ornament." Start at each letter than, following the arrows, trace out a pattern to form a number (see screenshot). When you get it right, you're rewarded with a WRENCH. Take it. and narrow, wooden device that seems to have a ball inside. There's an opening at the top where you could fit another ball (if only you had one). Back up and check out the corner of the room, just along the right edge of the window. Using the WRENCH you just won from the last puzzle, unfasten the STICK from the wall. Now back up and turn right to face the bed. Open up the box and you'll get HAPPY COIN 4/10. You'll also have a pretty handy box, best to hold onto it. Back up. Put the BOX in the pot of water to fill it up. Then take the BOX OF WATER over to the freezer, put it inside, and close the door. Insert the BALL OF ICE into the top of the device. Back up from the kitchen area and turn back to the wall with the half-arch display case. Remember that panel in the floor? 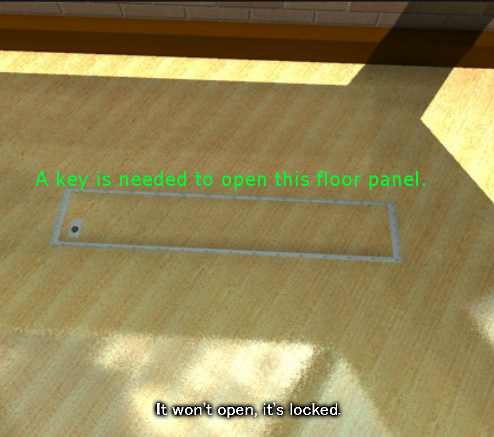 Use the SPADE KEY to unlock the floor panel. Then use the LEVER in the hole on the left side of the panel. A ladder will rise up. Now that you have all three ornaments, you can put them on display on the black base. Use the information you saw elsewhere in the room to put them in the proper order. With the three ornaments in their place, HAPPY COIN (8/10) will pop out. Take it. turn around three times to face the tall windows again. ...and get another HAPPY COIN (9/10). After all this searching around, maybe you're scratching your head wondering where the 10th happy coin is hidden? Well, let's see what you can do with only 9. The device has two buttons. One has a "W" on it. 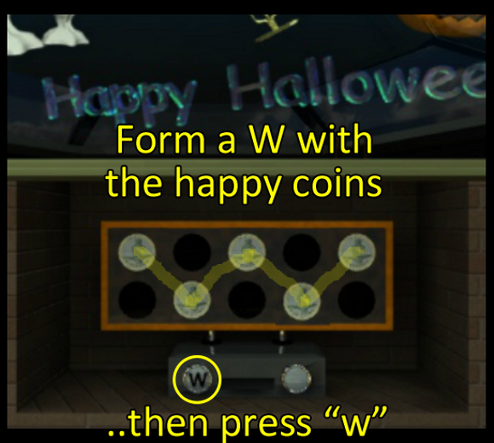 Arrange your happy coins to make a "W" on the coins device. When the coins are arranged properly, press the "W" button and you'll get the last HAPPY COIN (10/10). Woo hoo! Back up, turn right, and use the heart key on the door to escape. A walkthrough is on the way. Let me know if you have any questions. The key is to look around the floor. You will have to try at a certain angle after you've been both hot and cold. Am I missing an obvious clue for the baseball/soccer table? I have 8 coins and am at a loss. Gah...this went so well up until now! It wasn't very obvious to me...I was even surprised at how esoteric Tesshi-e was with that one. 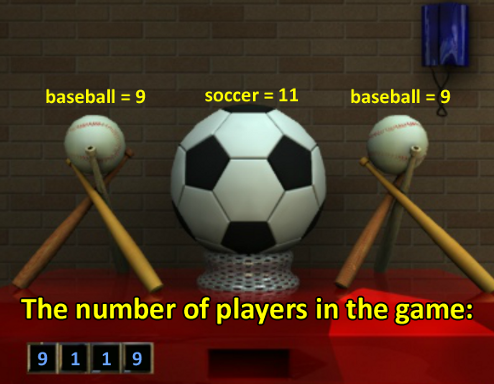 Think about the games those balls represent, and what numbers might be involved in them. metacom, I think I know where your tenth coin is, assuming you've solved the sports table that has Tenzhi and me puzzled. Hint - take the coins you already have and put them in their spots. But take careful note of the letter on one of the buttons on the machine you're putting them in. 3 Shrooms instead of 4 is still a decent score. Yeah, Jim, that was the one I was missing. Dang, I should have noticed that bit. Ah well, a fine escape. The sports bit was neat--I struggled with it for a while, but eventually decided to try out a theory that happened to be correct. I like puzzles that make me think, but that I can eventually get on my own--much more satisfying than either other extreme. Okay, so I may know how many players in a football team, and I can google how many in a baseball team BUT I don't think I should have to. A solution from outside the puzzle is almost akin to cheating on Teeshi-e's part! or maybe I am just miffed that that is the only puzzle I needed a hint on. Apart from that great as always. Geez, I never even saw the panel on the floor. nets. Or gloves. Or shoes. Or referees / umpires. Tesshi-e is so cool. His/Her games have such a pleasant atmosphere about them, and an engaging challenge. This one seemed a little too easy, but still a great escape. I never would have gotten the baseball/soccer numbers without the walkthrough, though! I got the sports puzzle right away, but had to look up the 'soccer' part. The 'w' one threw me for a bit, though. Hmm. No non-happy-coin ending on this one? There's got to be something we're missing, right? I mean, there's the sink and intercom which never do anything, and there are those pictures under the three puzzles. This room must have been changed in an update. It no longer has the Halloween pic or ornaments. The ornaments are now large round spheres. The picture is an abstract painting. Everything is generally the same. However, I have done this twice and can't get past the canister and the burner. I try to click on the part to open it. Nothing. I try clicking the canister and apply it to the burner. Nothing. So I can't hear the ice up, get the coin and use the water to make a ball of ice. I've literally done everything else in the room. I can't get past this so I can't move on. Please help. Is there something you need to open up the burner compartment before you add the gas canister? Also, there is not a coin on the canister anymore. So now I'm afraid I won't find 10 coins unless there's an extra built in somewhere. Just played it all the way through, worked fine for me.